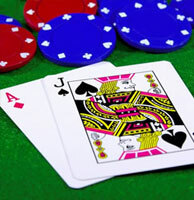 Blackjack is card game that is famous in all casinos without exception. This game is based on the card counting strategy. Its main meaning is to collect maximum amount of point that shouldn't exceed 21. Therefore Blackjack is also known as Twenty-one game. In comparison to other casino games such as Roulette, Blackjack requires certain skills and knowledge. Player may practice blackjack in internet casino for free. Before explaining gaming process it is quite important to emphasize on several main issues. Value of cards in Blackjack is as follows: all faced cards (King, Queen, Jack) and 10th have 10 points, Ace has either 1 or 11 points depending on the wish of player, all other cards are of their nominal values. The combination of Ace and 10 is the highest and is called Blackjack. The quantity of player depends on number of betting field, rectangular boxes drawn on the table layout. Bets in this game may vary according to the gaming table. Process of the game is not complicated. Dealer distributes cards among gamers including himself so that players have two cards and dealer only one. The main goal of each player is to make better his combination of cards by collecting 21 point, the same situation has a dealer. His total number of points should be no more than 17. By the way, the main negative point for player in Blackjack is that dealer receives his card in the last turn and the number of points for him to win is less than that of the player. Player can make some additional steps in this game: split his combination of cards into two hands in case if two initial cards are of the same nominal; double bet if initial cards are favorable on his mind, insure himself from the possible dealer's blackjack in case when dealer's only card is Ace or surrender the game if cards are unliked.